This week marks 17 years since Race legend Sir Peter Blake passed away. Revered by many as the greatest yachtsman of the modern era, Blake was 24 when he first took part in the Race as a watch captain onboard Burton Cutter in the debut edition in 1973. 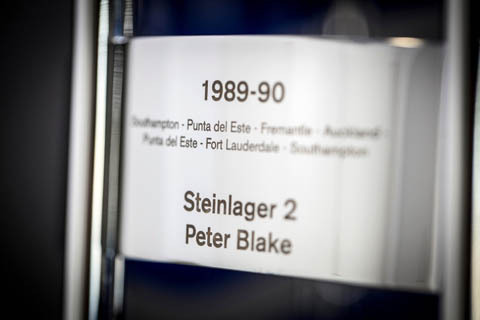 That experience proved to be the start of an almost two-decade, and five-race obsession – he returned the next edition as a crew member on Heath's Condor – and culminated in Blake claiming one of the greatest victories in the history of yacht racing in 1989-90, as skipper of Steinlager II. Blake and his crew completed a famous 'clean sweep' that edition, winning all six legs, and the skipper, famous for his height, blond shaggy hair and moustache, could finally celebrate a life-long dream fulfilled. But, his mission to lift the prestigious trophy was marked with misfortune and adversity, and at times, he must have wondered if it might never happen. It's a real story of perserverance and dedication to achieve a goal. Blake's first race as a skipper, onboard maxi Ceramco in 1981-82, was pretty much over before it began, with a cruel dismasting on Leg 1 from Portsmouth to Cape Town. The boat finished the opening leg under Jury Rig, and though Blake motivated his crew to go on and perform incredibly well in the following three stages, including setting a new Whitbread record 24-hour run of 316 miles on Leg 2, that breakage all but put paid to their trophy ambitions. In 1985-86, Blake returned, this time as skipper of maxi yacht, Lion New Zealand. He approached the build with a very specific idea of what he wanted – 31 tons actual displacement weight, very fast when reaching under two sails, fully controllable downwind with a spinnaker up – and the boat passed its first test, winning the Sydney Hobart Race with flying colours, and gaining the nickname 'the Urban Assault Vehicle'. But even the best builders can't factor in bad luck. On Leg 2, racing well toward his home stopover of Auckland, Blake saw his boat slow after sustaining rudder damage from a collision with a whale. And that wasn't the only drama for Lion NZ. On Leg 3, the crew sighted an iceberg close to starboard at 54 degrees south, estimated to be 1,500 feet long and 300 feet high. During a spinnaker change in 35 knots of wind, the crew lost control of the new, smaller spinnaker. Ed Danby went aloft to free it at the masthead, but as he was hoisted, his harness unbuckled itself. He saved himself from falling into the sea or crashing to the deck below, by clinging to a spreader. He stayed there in the heavy rolling conditions until another crewmember was hauled up to help him down. Nevertheless, Blake and Lion still had an opportunity to win the Race as they went into the final Leg 4 – but it was slim. Lying second on elapsed time, Blake could only win if UBS Switzerland suffered breakages and Drum – featuring Duran Duran star Simon Le Bon – was within 18 hours of Lion New Zealand. UBS Switzerland went east of the Azores High and entered a fast frontal system, while Drum opted to pick up the southerly winds around the back of the High, which slowed them down. 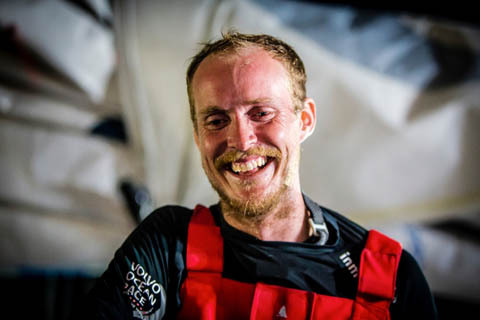 With just a few days left, they were becalmed and the gap to the leader stretched to 500 miles, which at the finish line in Portsmouth, translated into a 40-hour deficit. At the finish, Drum was overtaken by Cote d’Or, who crossed the line three and a half hours ahead. On arrival in Portsmouth customs officers, accompanied by sniffer dogs, boarded Drum just minutes after the finish to see whether the rock star had picked up any illegal substances in Uruguay. Blake and Lion New Zealand took second place on elapsed time in 1985-86 – close, but no cigar. For his fifth crack at the Whitbread, Blake took a radical step and built the biggest, heaviest yacht in the race, carrying 20 per cent more sail area than her main rivals. True to Blake's luck in the race up to that point, the initial yacht built had to be scrapped at the fitting-out stage after large areas of the high-tech carbon fibre-moulded hull were found to have delaminated. The delay cost two months of preparation but once the race started, there was no stopping Blake and his crew on Steinlager 2 as they swept all before them. Fans were treated to a great tussle with Grant Dalton's Fisher & Paykel but Blake's team had the edge throughout. In fact, as the pair raced into their native Auckland, just a mile separated the boats. The battle that ensued was one of the most memorable in sailing history, as Blake got the better of his opponent to steal the honours in his hometown. Here's Kiwi journalist Peter Montgomery remembering the duel below. "It was about time we won Everest, yeah, but there are a few more around that need to be looked at," said Blake, who would go on to achieve much more in sailing, but would never again take part in Race. Knut Frostad, former Race CEO, describes Sir Peter as 'the best there was in terms of seamanship'. After the Race, Blake went on to help mastermind twin America's Cup wins for New Zealand – inspiring a national craze for wearing lucky red socks along the way – and worked tirelessly to raise environmental awareness. Tragically, he was shot and killed by pirates in December 2001 while on a United Nations voyage in South America. He was just 53 and his death shocked a sport and a nation. Blake's legacy and achievements live on through the Race today. His widow, Lady Pippa Blake, was named an ambassador to the Volvo Ocean Race Legends in 2011, when former participants competed for the Sir Peter Blake Trophy, and his son, James Blake, was an Onboard Reporter in the 2017-18 edition.